Shirts With Random Triangles: Bret Bielema denies he and Nick Saban are "secret allies" in war against hurry-up no-huddle offense. Bret Bielema denies he and Nick Saban are "secret allies" in war against hurry-up no-huddle offense. 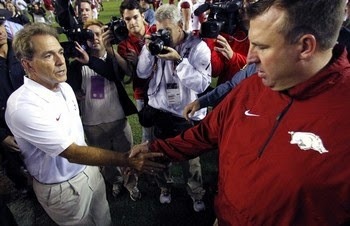 Nick Saban and Bret Bielema share and awkward handshake. Via CFT. Are Arkansas head coach Bret Bielema and Alabama head coach strange allies with warring hearts? Bielema discussed the allegations that he and Saban are "secret allies" in trying to suppress the hurry-up no-huddle offense in college football with Michael Carvell of the Atlanta Journal-Constitution. The Chick-fil-A Peach Bowl lives again. Jalen Whitlow to transfer, is an ex-Kentucky QB. Maryland adds JUCO defensive back Denzel Conyers. Miley Cyrus dons Ohio State basketball jersey. Dorial Green-Beckham is an ex-Missouri Tiger.